AMSTERDAM—Walking into De Ceuvel feels a bit like walking into a post-apocalyptic utopia. A dozen or so houseboats litter the ground around a gathering place, where a rusted hull has been cut in half and converted into benches. Slanted solar panels pepper the rooftops of structures built out of recycled materials, all of which are overlooked by an elevated greenhouse. Just north of central Amsterdam, this shared work space is an experiment in how to take an entire community off the grid. It’s beautiful. De Ceuvel got its start in 2012, when it secured at 10-year lease on a plot of land that had been a polluted shipyard. The new tenants quickly transformed the space into what they call a “Cleantech Playground.” That means almost everything within De Ceuvel’s walls is recycled, and folks working there seek to reuse everything from wastewater to heat. The Dutch call this circular living, and if De Ceuval is any indicator, it can work remarkably well, even within the bounds of a modern European city. The houseboats and other structures use over 150 photovoltaic solar panels to generate an average of 36,000 kilowatt hours of electricity per year. All of the boats are also equipped with toilets that recycle waste into compost for the greenhouse. A so-called Metabolic Lab and a café allow the community to turn rainwater into drinking water. The café uses herbs and vegetables from the garden for its dishes—which are delicious, by the way. In some ways, De Ceuvel can be thought of as a laboratory. 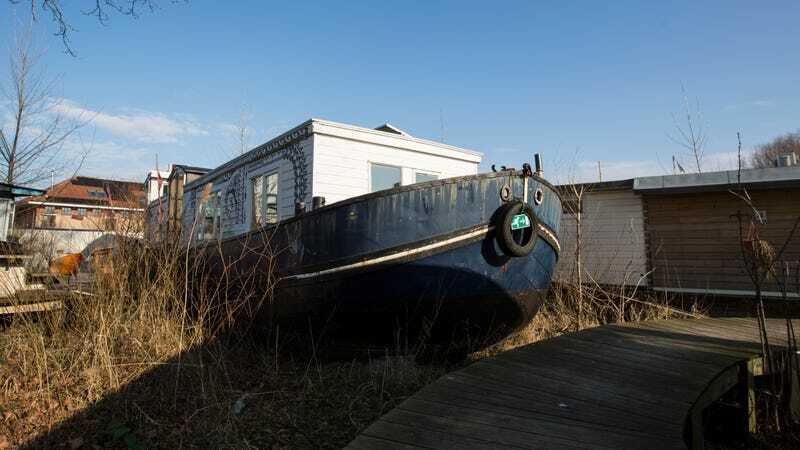 The plot of land where the houseboats sit is no larger than a city block, and there’s no room to expand. The ideas being developed by De Ceuvel’s tenants, however, have gone on to win numerous awards, including a Dutch Design Award, and are now being applied to other communities in Amsterdam. About a mile away, a new community will soon be built using the same principles of circular living. Near that, De Ceuvel collaborator Frank Alsema is building a huge house out of recycled materials, using some of the resource management techniques pioneered at De Ceuvel. Café De Ceuvel sits in the middle of the main yard, and the greenhouse in the upper left corner. Each houseboat features its own unique design, and a wooden walkway snakes between them. Throughout De Ceuvel, there are many repurposed boats. A glimpse into one De Ceuvel workspace. This houseboat has “heeey” painted on the side. On a recent visit, Earther walked the grounds, ate vegetables grown in the on-site greenhouse, and met some tenants. The community almost has a small town feel, full of smiling people and quieter than a forest. One could almost image the entire city of Amsterdam disappearing around it, leaving the tenants to fend for themselves without much trouble.